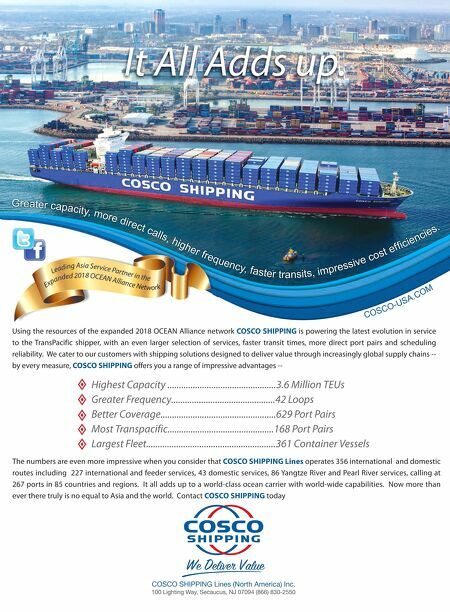 4 The Journal of Commerce | December 10 2018 www.joc.com Mark Szakonyi THE MAJOR CONTAINER lines' seeking an exemption to filing service con- tract agreements with the top US maritime regulator underscores how the industry is trying move away from bureaucratic practices long abandoned by other industries, cut costs, and become more dynamic. To some shippers, the World Shipping Council's (WSC) petition, filed Sept. 11 to the Federal Maritime Commission (FMC), looks like a recipe for uncompetitive behavior. Concerns expressed by shippers about the potential exemption are centered on contracts not being hon- ored and the potential for being hit with additional fees. Chippewa Falls, Wisconsin-based Wheaton Grain, for example, told the FMC in a Nov. 6 letter that facing a team of carrier attorneys, the service contract "is all we have to ensure that we can be treated fairly with the carriers." But the FMC doesn't consider contractual disputes regarding service contracts within its jurisdic- tion, giving shippers and carriers the choice either to take their disputes to the courts or seek mediation of- fered by the agency. The exemption will promote competition between carriers and non-vessel-operating common carriers (NVOs), which were exempted in July from filing service contracts to the FMC, said the National Industrial Transporta- tion League, a US shipper group. The exemption would also allow shipping to begin after contracts are finalized, instead of having to wait for them to be filed with the FMC, NITL said in a Nov. 19 letter to the agency. The shipper group stressed the need to keep an existing rule requiring carriers to retain copies of service contracts for at least five years. The rule, from which the WSC petition doesn't seek an exemption, allows the agency to review such agreements if there is an industry issue or complaint. "Indeed, based upon increasing consolidation among ocean carriers, League members favor vigilant FMC oversight of ocean carrier activities, especially those that are performed with immunity from the antitrust laws." Atlantic Container Line (ACL), which isn't a WSC member, said an exemption would also make US ports more competitive with Cana- dian rivals for US-bound or origin cargo. "Every American shipper that we deal with prefers the pricing simplicity of a cross-border move via Canada versus a move via US ports — all because of the "no filing" requirement," ACL President and CEO Andrew Abbott told the FMC in an Oct. 17 letter. An exemption does comes with minor costs. Gone would be the agency's review of contracts to make sure various fields are filled such as the minimum quantity com- mitment to port-pairs. The agency would lose out on data points that it uses to conduct its competitive analysis. FMC economists, for exam- ple, can analyze service contracts to measure whether a new carrier in the trans-Pacific is injecting more competition in the market. But the reduction in paperwork would be immense. There were 47,110 service contracts filed and 766,329 amend- ments filed to those contracts in the fiscal year ending Sept. 30 2017. FMC's Acting Commissioner Michael Khouri and Commissioner Rebecca Dye, both Republicans, have voiced support in cutting unnecessary regulation, paralleling the Trump administration's own broader effort. It's unclear whether the Senate will confirm the two commissioners appointed by the Trump administration in time for them to consider the petition, nor is it guaranteed the agency will consid- er the petition. Daniel Maffei, a Democrat whose five-year term expired in June, was reappointed last month, as was Louis Sola, who has served on the Florida Board of Pilot Commissioners, and is president and founder of Evermarine, a major yacht dealer. Sola has vocally backed President Donald Trump, joining with other 100 business lead- ers to write a letter of support for the then-candidate in 2016. Beyond the FMC's granting of a similar exemption to NVOs, there's been a broader effort to reducing fil- ing requirements relating to freight transportation. Trucking companies and railroads were released from the burden of filing tariffs listing their general prices with the Interstate Commerce Commission in 1994, and the ICC was shut down in 1995. The law now only requires those surface transportation carriers to keep copies of their tariffs. More than 20 years later, the ocean shipping industry is taking a crack at it. JOC email: mark.szakonyi@ihsmarkit.com twitter: @MarkSzakonyi Much ado about filing The Journal of Commerce (USPS 279 – 060), ISSN 1530-7557, December 10, 2018, Volume 19, Issue No. 25. The Journal of Commerce is published bi-weekly except the last week in December (printed 25 times per year) by JOC Group Inc., 450 West 33rd St., 5th Floor, New York, N.Y. 10001. Subscription price: $595 a year. Periodicals postage paid at New York, N.Y., and additional mailing offices. © All rights reserved. No portion of this publication may be copied or reprinted without written permission from the publisher. POSTMASTER: Please send address changes to The Journal of Commerce, Subscription Services Department, 450 West 33rd St., 5th Floor, New York, N.Y. 10001. 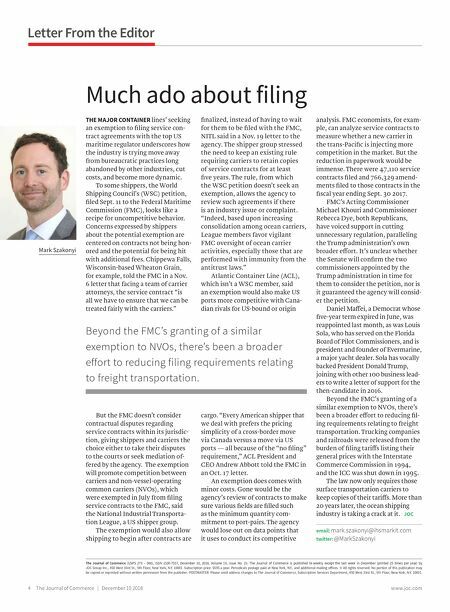 Letter From the Editor Beyond the FMC's granting of a similar exemption to NVOs, there's been a broader effort to reducing filing requirements relating to freight transportation.